Comprehensive and sustainable use of the marine environment is still a long way off: that is evident from the con­tinuing overexploitation of fish stocks in European waters, the oil pollution in the Niger Delta and the eutrophication of the Yellow Sea off main­land China. 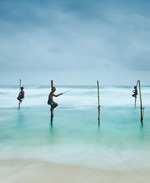 On the other hand, there are many positive examples which prove that pro­tecting the seas is possible – both at global and at regional or local level. The motivations for protecting the marine environment and moving towards sustainability vary considerably, as do the methods by which this is achieved. In some cases, massive public pressure has resulted in higher standards of protection or the use of improved technologies. In others, there were sound economic arguments for imple­menting appropriate measures. Often, a detailed costbenefit analysis revealed that investing in sustainability was the more cost-effective option. 4.7 > Emission Control Areas (ECAs) are sea areas in which shipping is subject to stricter emissions limits. Environmental organizations are calling for ECAs to be established in other coastal regions with a high volume of shipping traffic. In some instances, it takes time for states to reach agreement on marine protection regimes. Indeed, this is often only possible if the rules are not too stringent or the negotiating partners set long deadlines for achieving specific goals. This search for the lowest common denominator does not necessarily mean a poor compromise; it is often a crucial step in the right direction. A topical example is the reduction of harmful emissions from the burning of cheap, low-grade heavy fuel oil (HFO) in shipping. Ships running on HFO emit large quantities of sulphur oxides (SOX), nitrogen oxides (NOX) and particulate matter (soot) in their exhaust gases, which can cause respiratory diseases. While catalytic converters in vehicles and cleaner heating and industrial systems have done much to reduce air pollution in many ports, ships continue to emit their unfil­tered exhaust gas into the atmosphere. In some dockland areas, the concen­tration of air pollutants reached such high levels in recent years that new water­side housing projects were put at risk. There was also pressure from the tourism industry: the growing number of cruise ships led to a deterioration in air quality in the very coastal resorts that are popular with passengers and advertise the fact that they offer clean and fresh seaside air. In order to improve the situation, the member states of the International Maritime Organization (IMO) agreed that the emission limit values (caps) had to be reduced. Limit values are set under an IMO agreement, the International Convention for the Prevention of Pollution from Ships (MARPOL 73/78). MARPOL contains several annexes specifying in detail which particular types of pollution are prohibited. The new caps on exhaust gas are set out in Annex VI to the Convention. Among other things, the sulphur content in heavy fuel oil is to be reduced worldwide. Until 2012, a maxi­mum sulphur content of 4.5 per cent was permitted. This was lowered to 3.5 per cent in 2012, and will be reduced to a mandatory 0.5 per cent globally, although this will not happen until 2020. 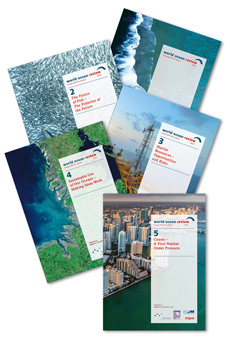 In addition, Annex VI to the Convention defines va­rious sea areas – known as Emission Control Areas (ECAs) – in which more stringent regulations apply. Emission Control Areas have been established for some of the busiest shipping routes where the adoption of special mandatory measures for emissions from ships is required to prevent, reduce and control coastal air pollu­tion. These special areas currently include the English Channel, the North Sea and the Baltic Sea, where there is a high volume of shipping traffic, and the waters off the coast of the US and Canada. A 1.5 per cent maximum sulphur content in fuel applied in the Baltic from 2006 and in the North Sea from 2007, and this was lowered to 1.0 per cent in 2010 and then to 0.1 per cent from January 2015. 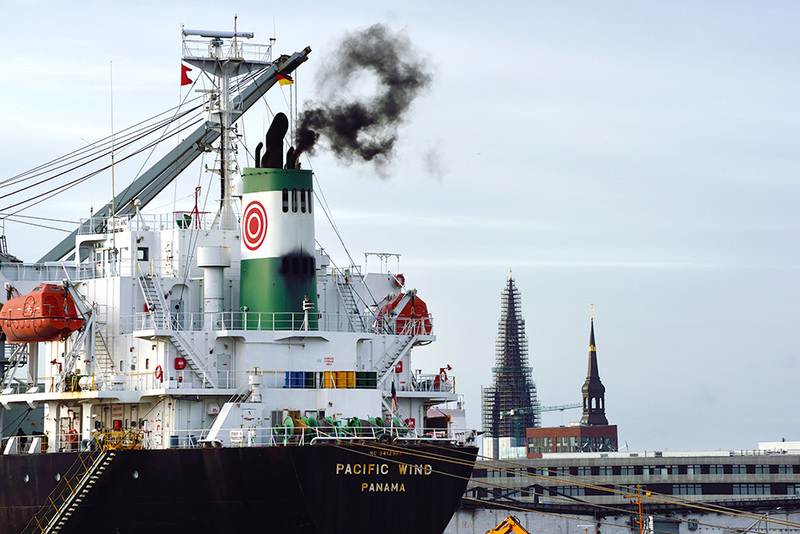 4.8 > Exhaust gases from shipping are a problem in many ports, such as Hamburg (above). Under IMO rules, these exhaust gases will contain lower levels of pollutants in future. Black smoke cannot be avoided altogether, however: it is emitted in short bursts from ships’ revving engines during docking. Noxious emissions from shipping can be abated if vessels switch to much more expensive diesel, or are fitted with marine exhaust gas cleaning systems. Both options increase the costs to the shipping companies, which vigorously opposed tighter emission limit values for many years. Environmental organizations therefore view the decision to allow vessels to continue to burn heavy fuel oil with a very high sulphur content (3.5 per cent) in international waters until 2020 as a concession to the shipping companies. The fact that these limit values were adopted at all, despite opposition from the shipping industry, is due to the cost-benefit ratio. Ports and coastal towns benefit from a thriving shipping industry, transshipment and cruise tourism as these sectors generate income. However, the tourism industry and local communities are vocal in their opposition to air pollution, with mounting public pressure against emissions from shipping in recent years, especially in the ECAs. Cruise ships and larger commercial vessels are therefore required to switch to diesel when lying at anchor in the ECAs. The more stringent IMO rules are intended to reduce air pollution from passing ships in future as well. The benefits, then, are better air quality in the ECAs and less conflict between the shipping industry, on the one hand, and tourism and ports/coastal communities, on the other. Environmental organizations are now calling for other sea areas, such as the Mediterranean, to be designated as ECAs. he MARPOL Convention is an international treaty, and compliance is therefore mandatory under international law. States which have acceded to the Convention are thus permitted to verify a vessel’s compliance with these more stringent emissions limits and, indeed, with MARPOL’s other provisions while the vessel is in port. Under this system of Port State Control (PSC), authorities may also levy fines for non-compliance, which must be paid immediately in cash. Vessels or their flag state may also incur penalty points under an international points system. The penalty point system enables persistently non-compliant vessels to be flagged up in the international databases, with the result that their masters must expect the checks to be repeated in other ports en route. Moratorium A moratorium is an agreement on the suspension of an activity, by which states undertake not to exercise their use rights or enforce claims to payments. A moratorium generally remains in force for a limited period. Various states or communities such as the Greenlandic Inuit, which depend on subsistence whal-ing, are exempt from the whaling moratorium. The International Whaling Commission (IWC) discusses such exemptions at its regular meetings. The commercial whaling moratorium is another example of a successful international agreement. Adopted by the members of the International Whaling Commission (IWC) in 1982 following the dramatic decline of many whale populations, the moratorium entered into force in 1986, spelling the end for the commercial hunting of the great whales. Progress towards this goal was fraught with difficulty, however. The IWC was established in 1948 by 14 member countries, all of which were engaged in commercial whaling on a relatively large scale. At that time, the IWC’s main pur­pose was to set whaling quotas, which were then allo­cated to the individual member countries. As the quotas were not based on whale numbers but were simply intended to ensure that the profits from whaling were shared as fairly as possible, whales were hunted relentlessly. In 1961/1962 alone – a record season – some 66 000 whales were killed worldwide. Studies undertaken in the Southern Ocean in the early 1960s revealed the severely depleted status of the whale populations for the first time. Catch limits, e.g. for blue whales and humpback whales, were agreed within the IWC framework on va­rious occasions, but several of the whaling nations opposed the restrictions and whaling continued. As whale populations steadily declined, the first of the major UN environmental conferences – the United Nations Conference on the Human Environment (UNCHE) in 1972 – ­called for a moratorium on commercial whaling, initially for 10 years. Nevertheless, whaling continued, where­upon various environmental organizations began to protest more vigorously against whaling – in some cases with headline-grabbing campaigns in which activists on inflat­able boats attempted to disrupt whaling operations at sea. In many countries, there was a shift in public mood, with growing opposition to whaling. In 1982, Seychelles abandoned commercial whaling and proposed a moratorium for the first time. Until that point, the IWC had mainly consisted of countries which were engaged in or supported whaling. However, the IWC is an international organization and is open to any country in the world, and now it began to attract more countries which were opposed to whaling. In 1986, anti-whaling nations formed the majority in the IWC for the first time, enabling the moratorium to be adopted. Iceland, Japan, Norway and the Soviet Union ­lodged objections to the moratorium and continued their whaling operations. Russia ceased whaling at the end of the Cold War, although it formally maintains its objection to the present day. Iceland and Norway have also maintained their objections but unlike Russia, they have continued their commercial whaling operations, setting their own catch quotas each year. Japan finally withdrew its objection but its whaling programme also continues, based on Japan’s invoking of a clause in the International Convention for the Regulation of Whaling – the IWC’s key document – which permits whaling for purposes of scientific research. 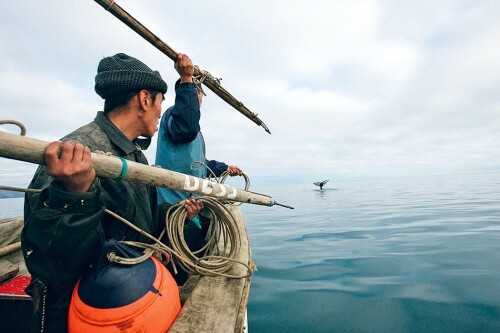 The IWC also allows some indigenous communities which have traditionally engaged in sub-sistence whaling to continue this practice for livelihood purposes. Despite all these limitations, the moratorium is widely regarded as a success. In 1982, prior to the moratorium, more than 13 000 whales were killed. Now the figure is around 2000 whales killed each year. Iceland and Norway mainly hunt northern minke whales (Balaen­optera acutorostrata). Iceland also catches fin whales (Balaen­optera physalus), which are still relatively abundant. Blue whales and other species described by the IWC as rare species requiring special protection are not hunted. Another success is that the moratorium has made it possible to establish the Southern Ocean Whale Sanctuary in the area surrounding Antarctica, which is an important region for whales. Even today, there is an ongoing dispute within the IWC as to whether the ban on whaling should be eased. Japan in particular is attempting to win other member states’ support for its interests. However, there is no need for concern about a possible softening of the moratorium at present. 4.9 > For the men of the Chukchi people in northeast Russia, hunting gray whales is an age-old tradition. They use the meat to feed themselves and, above all, their sled dogs.